Dark Moor's seventh album Autumnal finds the band at the top of their game. I've been a fan for many years and I think this is their best work to date. In reality, Dark Moor is not breaking any new ground here. They're simply producing what they do best which is epic, symphonic, and melodic power metal. There is certainly nothing wrong with consistency especially when it's done very very well. The hallmarks of Autumnal are twofold (but I could probably speak to more). First, the lead vocals and vocal arrangements are both characteristically immense and beautiful often verging on grand choral qualities. Most of this is accomplished by Alfred Romero's presence but also with the aid of Itea Benedicto, a soprano and current lead singer in the Spanish band Niobeth. Though evident throughout, I found 'Swan Lake' (based on Tchaikovsky's ballet), 'On The Hill Of Dreams' and 'When The Sun Is Gone' to be my favorite examples. The second hallmark is the astonishing and epic song compositions. Most songs turn on a neo-classical motif that are sweeping and grandiose. 'Faustus' displays this eloquently as does the marvelous 'For Her' and the aforementioned 'On The Hill Of Dreams.' Furthering the classical method is the wonderful instrumental that closes the album. 'Fallen Leaves Waltz' is exactly that, a waltz. Very few metal bands can pull something like this off, but Dark Moor is one of them: they are that good. 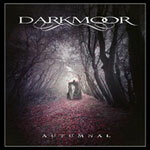 Dark Moor's Autumnal is a grand work of epic symphonic power metal. It's their best work to date. Combining rich vocal arrangements with massive neo-classical compositions, Dark Moor succeeds in creating muscular, melodic and incredibly entertaining music. Highly recommended! Dark Moor's Autumnal is a grand work of epic symphonic power metal. It's their best work to date. Combining rich vocal arrangements with massive neo-classical compositions, Dark Moor succeeds in creating muscular, melodic and incredibly entertaining music.